If you’ve just started to consider taking steps toward a pure vegetarian diet, you’ve probably wondered if that means giving up some of the foods you’ve always enjoyed. Lacto-ovo vegetarians eat dairy products and eggs, excluding meat. But those opting for a pure vegetarian diet choose to exclude meat (including fish) as well as eggs, dairy and all other foods containing animal-derived ingredients. This seems limiting but it really is not. 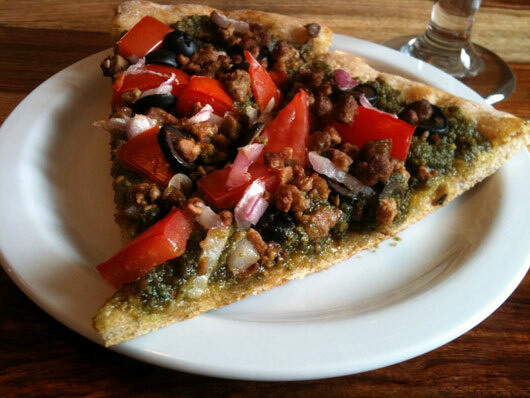 Below is one of my favorite Sunday afternoon recipes: Pesto Pizza. To incorporate a bit of pure vegetarianism into your diet, you don’t need to give up pizza — simply eliminate the cheese and finish off your handcrafted pie with flavorful sauce and toppings. You can easily make your own dough, but for this extra-quick recipe I’ve used a pre-made whole wheat vegan pizza crust. Preheat the oven to 450° F and lay your pizza crust out on a round pizza tray. Drizzle the crust with olive oil and let sit while you prepare the pesto. Prepare the pesto: Turn on a food processor fitted with the steel blade and drop in the garlic to chop it. Add the basil, chopped pecans, salt and nutritional yeast and pulse until the basil and nuts are coarsely chopped, then process until finely chopped. While still processing, slowly drizzle in the oil. Transfer to a small bowl and season with salt to taste. Prepare the pizza: Spread a thin layer of pesto sauce over the crust, to within ¼ - ½ inch from the edge of the crust. Sprinkle on the toppings. Place the pizza in the oven and let cook for 10 – 12 minutes, until crust is nicely browned and the top is bubbling. Let sit for 5 minutes to cool slightly. Slice and serve. *Adapted from a recipe by Mario Batali. This looks super tasty! I can give you my husband's pizza dough recipe if you are interested. Nothing like fresh dough and it easy to make(and its vegan). Thank you! I plan to post another one soon with cashew cream ricotta and different toppings. I do have my own dough recipe (I was just being extra lazy when I made that pizza yesterday) but I would love to get your husband's, too.